So you’ve added video to your content marketing strategy. Fantastic! Video is a phenomenal (and extremely effective) form of content. By 2021, Cisco predicts that video will make up 82% of all consumer traffic. As it stands, 55% of people watch online video every single day. According to a study by Vidyard and the Aberdeen Group, businesses that use video grow 49% faster than those that don’t. However, all the stats in the world won’t make video work for you unless you have a clear video marketing strategy and set realistic, attainable, and trackable goals. In this post, we’re going to take a look at how you can set marketing goals and targets that’ll get you where you want to go. Let’s dive in. Content marketing often suffers from the spaghetti dilemma. We put together some content and throw it at the audience. If it sticks, we make more. These aren’t bad things to strive for. The problem is that unless they’re attached to a specific goal, they’re vague and vague goals don’t get results. To build an effective strategy you need to be clear about what you want. You have to dig deep and find your why. To build an effective strategy you need to be clear about what you want. You have to dig deep and find your why. Why do you want more engagement? Why do you want a bigger Facebook audience? Growing your channels for the sake of doing it doesn’t yield a specific result. So you have to ask: What do I want to get out of this? Do you want to get more customers? More sales? Are you growing your Facebook page so you can have a warm audience for a targeted Facebook ad campaign? Do you want more engagement so you can find potential brand ambassadors? Get really clear about the reason behind the goal. That way, you can measure its impact and then tweak, test, and adjust your strategy until you get it right. Simply asking ‘why?’ every time you set a goal will save you from throwing content at the wall and hoping it sticks. Talk about a competitive advantage! We talked about defining your goals. Now, we’re going to look at the two most common goals marketers have: growing an audience and making more sales. The challenge with these goals is that they’re huge! It’s hard to get super-specific when your goal is actually a bunch of mini-goals all gathered up under a giant umbrella. That’s why you need to break them down into smaller chunks and create specific targets for each one. Then you need to craft the right type of videos and measure the results using solid analytics software. Growing your audience is essential. Getting your products and services in front of more people means more potential customers and opportunities to close sales. But before you start making videos, you need to decide which audience you want to grow. Do you want to grow your email list? Your YouTube community? Your Facebook page? The number of visitors to your website? Don’t be tempted to go after every channel at the same time. Choose one and focus on it. It’s much easier to track and it’ll protect you from burnout. Next, set realistic targets and a time frame. Shorter time frames tend to work better because it’s easier to visualize them and keep yourself accountable. For example, you might commit to growing your email list by 10% over the next 3 months. Break this goal into weekly targets so you know what success looks like each week. This will help you stay motivated and help you smash your target. Now, about the videos. If you’re looking to grow your audience, make videos that answer questions from the awareness stage of your buyer’s journey. Don’t introduce your product in an overt way just yet. Instead, focus on your viewer’s pain points. What’s your product going to help them with? How will buying it make their life better? A bit of research on the questions your potential customers are asking can go a long way. To survive, a business needs to make sales. The right video strategy can help you with that. Pick a channel to focus on, set a goal and a time frame, and break the main objective down into smaller chunks. Next, focus on creating content aimed at customers toward the end of the buyer’s journey. Explainer videos, product videos, case studies, and testimonials all work really well at this stage. Your sales and customer support teams are a goldmine of relevant information. Speak to them, find what they get asked most often and make short videos that answer those questions. Don’t have that kind of data yet? No problem! It’s time to spy on your competition. Head over to their website and social media channels. What’s in their FAQs? What are their comment sections like? What are customers asking them on social media? Create videos that answer these queries. All the goals and targets in the world won’t help if you don’t track and measure how successful they are. We wrote an in-depth guide to video analytics, so we won’t go into too much detail here. To summarize, before you start tracking a video you need to set a clear goal for it. You’ve got to define what that video will do. Each video should support a specific goal. You also need to understand all the different metrics you can measure, and pick the ones that align with your goals. Track those metrics, then keep adjusting and improving your video content based on the results. 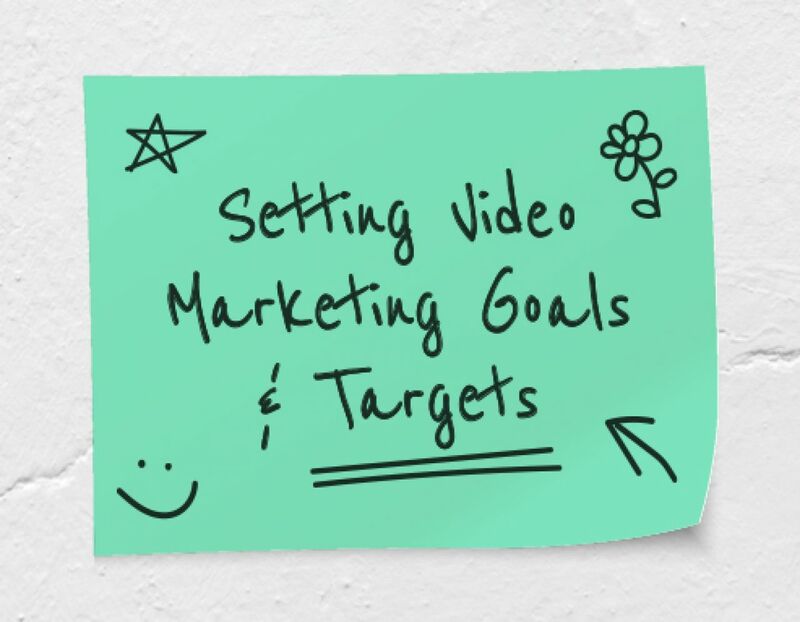 By getting crystal clear about your goals, breaking them down, then setting appropriate targets and tracking them, you’re setting your video content marketing efforts up for success! By the way, if you’re looking for a really simple way to make phenomenal videos, check out Biteable. You can get started for free! Just head over to our extensive template library, pick the right one for you, and start creating. You’ll have a brand new video in minutes.